Scooter and wheelchair lifts allow users to transport mobility devices easily. Handicap lifts come in interior, exterior and hybrid models and can attach to vans, sedans and other vehicles. We selected our top picks by considering price, accessibility features, availability, weight capacity, transferability and consumer reviews. When considering which lift is right for you, think in the long-term. What will be the easiest for you to operate every day? Do you need an interior lift, exterior lift or a hybrid lift? What is your budget? If possible, the price should be a secondary issue when considering the best wheelchair or scooter lift. What we like: The Millennium Series is BraunAbility’s most popular wheelchair lift. Lifts can be installed in the side or rear of vans and are available in three sizes — 43, 47 and 51 inches — so it can accommodate a range of wheelchair sizes. The platform lifts weigh 332–354 pounds, depending on their size. The Millennium Series is VA-approved and compliant with the NHTSA (National Highway Traffic Safety Administration). The Millennium Series is operated by handheld control, on-lift control or remote control. Color-coded rocker switches provide an easy way to control the wheelchair lift, even for those with limited dexterity. If anything goes wrong, the Millennium Series has a built-in diagnostic system that makes troubleshooting easy. Your local BraunAbility dealer can also provide services and repairs after purchasing and installing the Millennium Series. BraunAbility provides leasing options on its website — approvals take about two minutes. What to consider: The Millennium Series is intended for vans. It won’t work for smaller vehicles like sedans because of its large size. Also, if you choose a platform length of 47 or 51 inches, the top and doors of the van will need to be raised. Bottom line: If you have a van, the Millennium Series by BraunAbility is a solid choice that comes in a variety of sizes. It’s best for those who need to lift a heavy mobility device, but also want a quiet ride. What we like: The Curb-Sider is Bruno’s most popular classic hoist-style lift, which means the wheelchair or scooter is lifted up and into the car via a docking device. Hoist-style lifts like the Curb-Sider are compact, so it’s ideal for trucks and even leaves room for the third row of seats in vans. When the Curb-Sider isn’t in use, it can be folded down. That way, you can easily see out the rear of the car while driving. The Curb-Sider doesn’t require vehicle modification in any way, so it can be transferred from car to car. It is available both for side entry and rear entry and is compatible with a wide variety of vehicles, including trucks, SUVs, vans, minivans and crossover vehicles. We also like that the Curb-Sider comes with a three-year limited warranty and that the hand control is weather resistant. The VSL-6900 model of the Curb-Sider has an extra extension to help with larger mobility devices and vehicles with large bumpers. Simply attach the docking device to the wheelchair or scooter, then push a button and the Curb-Sider will lift the scooter into the vehicle. Some gentle guidance could be required to help it move in smoothly—then push the docking button to lower the wheelchair to the floor. What to consider: Make sure you are physically able to operate this wheelchair lift before purchasing, as it does require some effort. The operator needs to be able to walk a few feet, operate the docking device, bend over and use the buttons on the handheld control. The best way to know if you’re able to do this is to try out the wheelchair lift in person. Bottom line: The Curb-Sider is an affordable option for those with the dexterity to operate it. If you aren’t able to operate it, you will need someone to help you. The Curb-Sider is also a good choice for pickup trucks. What we like: The Harmar AL350 by Harmar is compatible with both scooters and wheelchairs. The platform measures 27.5 inches by 39 inches and can accommodate most midsized mobility devices. Four adjustable straps are used to tie down the mobility device and keep it stable. A simple switch makes it easy to raise or lower it, a convenient feature for users with limited dexterity. The switch also has a key for added security. Customizable features on this model include the hitch type, power supply and swing away option. Professional lift installation is available for an additional fee. The Harmar AL350 comes with a three-year limited warranty. The warranty is transferable, meaning the warranty comes with the lift if you decide to sell it, which increases the value of the lift and the car it’s associated with. If you are dissatisfied with the Harmar AL350, you can return the product within 30 days. Certain terms and conditions apply. What to consider: This particular model by Harmar is only sold through Spinlife dealers, so make sure to narrow your search to nearby Spinlife locations. This model can lift 350 pounds, so it cannot accommodate the heaviest mobility devices. A small percentage of reviewers also mention the tie-down straps as being a bit difficult to use, though these can be replaced with better ones. Bottom line: The Harmar AL350 is best for those looking for an affordable, convenient power lift for their mobility device. However, those looking for the latest technology or a lift capable of carrying a wheelchair or scooter on the heavier end of the spectrum have better options. Bruno is a third-generation family business that has created products for people with limited mobility for over 30 years. Bruno stairlifts are manufactured in the United States. Discount Ramps offers a convenient one-stop site for someone looking for an accessibility ramp or lift. With a steady churn of new inventory, deals rotate almost daily. 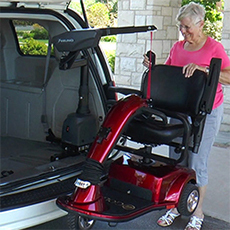 Harmar boasts a variety of lifts for both vehicle and residential platforms. They design, manufacture and market their products in North America with a growing influence in South America, Europe, Asia, Africa and Australia. MobilityWorks has been providing the county with wheelchair accessible vehicles since 1997. The company emphasizes face-to-face dealings and comprehensive consultations with their customers. Since 1999, SpinLife is an online retailer of durable medical equipment with an extensive stock of scooter lifts and ramps. Buying in bulk allows them to keep prices low and inventory in stock. There are several factors to consider when choosing a wheelchair lift for a car, truck or van. One such factor is the type of wheelchair lift you want. The type that’s best for you will depend on your vehicle, whether you have a wheelchair or a scooter and your mobility capabilities. In general, smaller vehicles benefit from an exterior lift and interior lifts work well with larger vehicles. Users with limited mobility often prefer hybrid lift options, as these are the easiest to operate. If in doubt, an affordable exterior lift is a good option because of its ease of use and ability to be easily transferred to another vehicle. An exterior scooter lift for cars is a platform mounted on the outside of the vehicle. They are popular because they are affordable and compatible with almost any vehicle. Wheelchair hitch lifts take up no space within the car and can easily be transferred from one vehicle to another. To operate this type of lift, the user needs to be able to walk a few feet comfortably, stand for a few minutes, maneuver the mobility device onto the platform and operate buttons on a power lift. The mobility device is strapped to the lift using tie-down straps that keep the mobility device in place. One drawback of exterior lifts is that they leave the mobility device exposed to the elements. Exterior wheelchair lifts are best for smaller cars like sedans that don’t have room inside and for people who don’t have someone to help them with getting a wheelchair into a car. Interior wheelchair lifts are mounted inside the vehicle, and the device lifts the wheelchair into the car. Most interior lifts are docking devices that lift the mobility device using attachments. 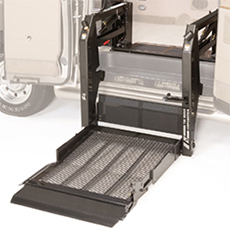 Interior wheelchair lifts work when raising into a truck bed, rear cargo area or side-entry of a van. It typically can be collapsed so it doesn’t take up too much space when not in use. Interior lifts are more difficult to operate than exterior lifts. To lift the wheelchair or scooter, the user has to attach the docking device to the wheelchair. The device lifts the scooter up and into the vehicle. People using this form of lift will need to be able to walk comfortably a few feet, stand for a few minutes, hook the docking device to the wheelchair and guide the mobility device into the car. Those with physical help from another might like this best, as will those with available space in their vehicle. A hybrid lift accepts a drive-on platform, like exterior lifts do, but also takes the wheelchair inside the car, like interior lifts. A hybrid lift does not require extensive remodeling of a vehicle — it will attach to your vehicle seating and extend out of the car to allow the placement of the mobility device. Hybrid lifts require the user to walk a few feet, stand a few minutes, move the mobility device on and off the platform and use buttons to operate the lift. One drawback is that you still need tie-downs, even though the mobility device is stored within the car. Hybrid lifts are best for vans, SUVS and other large vehicles since the lift platform needs to fit inside the vehicle. Hybrid lifts provide the ease of exterior lifts with the added protection of interior lifts. How much does a wheelchair lift for a van cost? An interior wheelchair lift that can be detached from the car costs between $1,000 and $3,000; simple exterior lift costs range from $200 to $1,000. Manual exterior lifts fall toward the lower end of this range, and powered lifts fall toward the higher end. More complex exterior wheelchair lifts for cars can cost more, between $5,000 and $10,000. Wheelchair lift prices also depend on factors such as equipment quality, ease of use, size and lift type. Does Medicare cover wheelchair lifts? No. Under Medicare Part B, durable medical equipment (DME) can be covered — this includes wheelchairs and scooters themselves, but not wheelchair lifts or scooter lifts. Although many people think a wheelchair lift should fall under the DME category, Medicare does not classify it as such. For that reason, Medicare will not cover a wheelchair lift. Bruno Independent Living Aids sells 11 types of wheelchair and scooter lifts. All wheelchairs and lifts can be purchased from a local Bruno dealer, who also installs the lift and makes future repairs if needed. Bruno’s most popular models are listed below. Joey: The Joey is a simple button-powered interior wheelchair lift that works best with larger vehicles. Simply drive up the mobility device onto the platform, press the button and the Joey will lift your device up and into the vehicle. Out-Sider Micro: Bruno’s lightest scooter lift is designed specifically for three-wheel scooters. With a weight capacity of 145 pounds, this model does the job while maintaining a discreet design. Chariot: This exterior platform lift is perfect for both scooters and wheelchairs and can carry up to 350 pounds. The Chariot is one of Bruno’s most flexible models and is compatible with almost any vehicle. Out-Rider: Specifically designed for pickup trucks, this exterior lift raises mobility devices up and into truck beds. You can also purchase a Bruno Stow-Away to help you get into your truck more easily. Curb-Sider: The Curb-Sider is an interior hoist-style lift. Simply attach the docking device to the mobility device, and watch your chair or scooter be lifted gently into your vehicle. BraunAbility’s lifts are specifically designed for campers, RVs and full-sized vans. Their models work well for families and users with larger wheelchairs. All lifts are installed by a BraunAbility technician. You can schedule a consultation with a local BraunAbility dealer to see which wheelchair or scooter lift is best for you and your vehicle. Every BraunAbility lift has a 1,000-pound weight capacity and comes with a remote control. UVL (Under Vehicle Lift): The UVL features a 48-inch ramp that retracts beneath the vehicle when not in use. For this reason, anyone can enter the car where the UVL is located, not just a wheelchair user. Millennium Series: The sturdy Millennium Series model can be installed either in the rear or on the side of a van. It is fully hydraulic and is BraunAbility’s most popular model. Century Series: This is a more affordable version of the Millennium Series lift and can be installed either on the side or in the rear of a van. It lacks some of the more technologically advanced features of the Millennium Series, like the built-in diagnostic system, but is still a solid choice for wheelchair and scooter users. DiscountRamps.com is a wheelchair and scooter lifts dealer. This means they sell a variety of products from different manufacturers, including Apex, Great Day, Harmar, Silver Spring and Tilt-A-Rack. Despite their name, they sell more than just ramps, although some of their lifts do come with ramps. Most products come with a one-year warranty. Not all warranties are transferable, so it’s important to ask before buying, especially if you think you might sell your car. Silver Spring Universal Power Chair: This exterior platform lift is made of lightweight aluminum and can carry up to 350 pounds. The platform is 39 inches by 27 inches and can fold up when not in use. Tilt-A-Rack Full-Size Carrier: This exterior platform model comes in two variations; one can carry 350 pounds, and the other can carry 500 pounds. Both come with one-year warranties and can fold up and out of the way when not in use. Apex Premium Cargo Carrier: This exterior lift by Apex comes equipped with a ramp and can carry up to 500 pounds. The platform measures 60 ¼ inches by 31 ⅞ inches. Additional ratchet straps and hooks are available as add-ons. Great Day Mighty Lite: This exterior lift fits easily onto your hitch and looks great; it’s made of lightweight aluminum but is coated with black powder enamel finish. 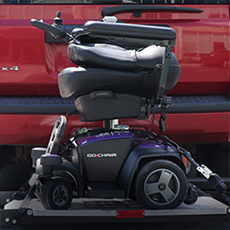 The 48-inch-by-28-inch platform can accommodate most mobility devices. Harmar manufactures wheelchair and scooter lifts and sells them through dealers nationwide. They have dozens of lifts available, including exterior lifts, interior lifts and hybrid lifts. Their website is full of informative data about types of lifts, how to know which lift is right for you and the mobility requirements for different lifts. You can also search for local dealers and get in contact with them to learn more. AL055: The AL055 is a 200-pound-capacity interior lift that is compatible with most vehicles. It power lifts and requires some manual rotation to fit the mobility device into the back of the vehicle. AL001: The AL001 is an exterior platform lift capable of lifting up to 500 pounds. It’s 28 inches by 48 inches in size, meaning it can fit most mobility devices, and also comes with a folding ramp. AL600: The AL600 is a good choice for larger vehicles like vans and SUVs. This hybrid model can lift up to 350 pounds and leaves space in the vehicle for a second row of seats. AL690: This lightweight hybrid model can transport wheelchairs and scooters weighing up to 275 pounds. It’s weatherproofed and comes with a remote control. Wireless options are available. AL825: The AL825 is an exterior model specifically for trucks. It lifts mobility devices twice as fast as similar models and has an adjustable boom height. MobilityWorks is a dealer for wheelchair lifts, scooter lifts and other mobility devices. This means they help consumers find the best model for them from a wide variety of manufacturers. They sell models from Bruno Independent Living Aids, Harmar, Pride Mobility and others. MobilityWorks has 70 dealer locations in 24 states. If you are a veteran, MobilityWorks can work with you to get the correct forms from the Veterans Administration and help you with other VA issues. Bruno Out-Sider: This exterior platform lift from Bruno Independent Living Aids can lift mobility devices weighing up to 350 pounds. The platform conveniently folds up when not in use and can be driven on or off from either side. ScootaTrailer: The ScootaTrailer is a trailer capable of carrying up to 600 pounds. The ScootaTrailer is low to the ground and therefore works best with compact cars. Straps and tie-downs keep the mobility device in place while the vehicle is moving. Harmar Axis: The Axis is a series of interior lifts from Harmar. They can lift 400 pounds and are compatible with most trucks, SUVs, minivans and full-sized vans. Wireless controls are available. Pride Olympian Autolift: This series of interior lifts from Pride Mobility comes in two models capable of carrying 260 pounds or 440 pounds. Both models are easy to remove and transfer to another vehicle if necessary. SpinLife is a dealer that sells wheelchair lifts and scooter lifts from several different manufacturers. Some of their partners include Harmar, Rage Powersports, E-Z Carrier, Great Day, WheelChair Carrier and Pride Mobility. Most of their lifts can be installed without professional help. Most models come with a one- or three-year warranty. You can return a lift if you are dissatisfied. E-Z Carrier 3: This durable exterior platform lift comes with a 42-inch ramp and can lift devices weighing up to 400 pounds. The three-inch security rail adds peace of mind. The model comes with a one-year limited warranty. SC500-AF: This model comes with a 59.25 inch ramp and a one-year warranty. It can lift up to 500 pounds and can accommodate full-sized scooters and power wheelchairs. Lift ’n’ Go: The Lift ‘n’ Go from WheelChair Carrier is an exterior lift capable of carrying and lifting 350 pounds. The Lift ’n’ Go comes with two retractable ratchets, a hardware kit and a three-year limited warranty. AL003 Tilt n Tote: This exterior hoist lift can work well for manual wheelchairs with its lifting capacity of 100 pounds. Its tilting feature makes it easy to roll a wheelchair on and off.